There are 57,000 kids at the border who need temporary shelter. Shame on the Democratic governors who are turning them away. Immigrants who have been caught crossing the border illegally are housed in McAllen, Texas, where they are processed, on July 15, 2014. 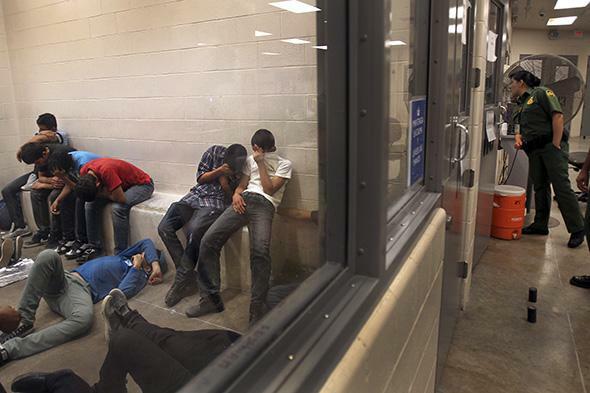 More than 57,000 unaccompanied children have been apprehended at the southwestern border since October. Immigration is a complex problem. So is the long-term question of how the United States should handle the influx of tens of thousands of children from Central America. Beyond the legal mandates, we owe them basic human decency. On the other hand, to say that they should all simply stay here for good begs big questions about encouraging more children to make this journey, and the rights of all the people abroad who are waiting their turn in line. Unless you believe in open borders, it’s all thorny. What seems right for an individual child can seem wrong systemwide. But there’s a short-term question that’s not hard to answer at all: Where should the 57,000 children who are already here go? The answer is: Every state should be raising its hand and offering to take some of them. This is not a border-state problem. It is not up to Texas and Arizona to carry this load just because they’re the first places the children land. States in the Northeast and the Midwest can take some of these kids too. Yet some states are looking only for excuses to say no. Their leaders—including in my own state of Connecticut—are behaving shamefully. This NIMBY response is the worst kind of hypocrisy, especially coming from supposedly liberal blue states. Got a star on the flag? That means you have to pitch in right now. Instead of showing some heart, my governor, Dannel Malloy, is looking heartless and feckless. He claims otherwise: “Obviously, our hearts go out to the children in this situation,” his communications director said. But that is an empty piety if I’ve ever heard one. Asked by the Obama administration to temporarily house 2,000 immigrant children at a nearly vacant training school in the town of Southbury, Malloy said no. “We don’t currently have the ability to meet this request,” the same spokesman claimed. Malloy’s administration says Southbury is too small and decrepit. Never mind that the federal government would pay for getting the facility ready for the children and for upkeep. If Southbury, built in the 1930s for developmentally disabled people, is really unusable, then Malloy should find another place for these kids. The only reason why he so far has not is politics: He is in a battle for re-election with Republican candidate Tom Foley. “The bottom line is that too many swing voters fear immigrants, and Malloy doesn’t want the ‘optics’ of hundreds of brown-skinned, Spanish-speaking children being bused into Connecticut,” the New Haven Register editorialized last week. This is just ugly. Since Malloy also faces a third-party challenger from the left, maybe he should rethink his political calculus anyway. But the bottom line is this: Why elect Democrats if they act this lily-livered when doing the right thing carries any political risk? On the Cowardly Governors list with Malloy: Terry Branstad of Iowa, a Republican. Branstad too expressed “empathy” for the immigrant kids and then said no to taking any children, even as a facility for at-risk youth was readying a 48-bed unit. “We’ve always felt we’ve been good partners with the state. We met with officials and decided it was not in any of our best interests to do it,” Steve Gilbert of Sequel Youth and Family Services told the Des Moines Register of deciding not to take the kids. Maryland Gov. Martin O’Malley, a Democrat, scrapped a proposed site in his state without coming up with another alternative. Update, July 23: The governor’s office responded to say that O’Malley is working with faith leaders to find foster homes and other small settings for some children. Then there’s the role of the 2008 reauthorization of the Trafficking Victims Protection Act. At the time, it coasted through Congress with support from both parties. Now it’s much-maligned for giving children from Central America (outside of Mexico) the right to a court hearing before they’re deported, and placing them in the custody of the Department of Health and Human Services (rather than immigration authorities). At the hearing, the children still have to prove they deserve asylum—a high bar. But the fact that they get to stay in the meantime has probably helped fuel the exodus. So here they are. Is it me, or does it just seem un-American for protesters to turn away young children with signs like “Return to Sender”? That sort of NIMBY nastiness is afoot in California, Arizona, New Mexico, Washington state, and Virginia. But in the race to the bottom, Michigan probably wins: Protesters there brought guns. Among governors, Chris Christie of New Jersey says his empathy extends to considering “every request that comes based on its merits.” We’ll see if that translates into action. Deval Patrick of Massachusetts has found two sites that could host 1,000 children, ages 3 to 17. Peter Shumlin of Vermont says he is looking at sites, in response to a request from HHS. The state and local officials who step up to give (temporary, paid-for) shelter to these kids are the ones acting like public servants. As the writer Sonia Nazario has pointed out, we expect countries next to ravaged places like Syria to absorb millions, not thousands, of immigrant refugees. The parallel isn’t exact: Gang violence, however bad, isn’t the same as full-out war. But the demands being placed on the U.S. aren’t the same, either. Spread among the 50 states, these children are surely manageable. If you live in a blue state and you’ve ever shaken your head over anti-immigrant sentiment in the red states at the border, this is your moment. Tell your local and state leaders to be brave.